We continue our countdown of the Top 50 Prospects in the 2018 MLB Draft by looking at the players ranked 11-20. During the last countdown we started seeing some more high school pitchers appearing and that trend will continue during this countdown. There are also a couple more college arms revealed in this list, which means that the Twins should have their pick of pitchers at pick number 20 if that is the route that they choose to go. Cole Winn has vaulted himself into this group of high school pitching prospects with the very good spring that he has put together. His fastball is up to the mid-90s and he is now throwing both a slider and curveball. Of the two his 12-6 curveball is the better pitch and could be a wipeout pitch for Winn down the road. For a high school pitcher, Winn’s mechanics are about as clean as it gets. Winn has an over-the-top delivery that is very easy for him to repeat. This is what has helped Winn be so consistent, even after making the move from Colorado to California to face better competition. Winn doesn’t have as much upside as some of the other high school pitchers around this slot, however, with the track record of high profile high school pitchers not panning out, it might not be a bad idea to hedge your bet on a kid who has shown much more of an ability to pitch and not just throw at a young age. Much like Cole Winn, Ryan Weathers is a high school pitcher who classifies into the high floor segment (at least as far as high school pitchers go). Weathers features a solid three-pitch mix and has excellent command of all three pitches. This bodes well for his chances at become a starter that the major league level. While Weathers doesn’t have an electric fastball that touches the mid to upper 90s, he is still an excellent athlete. Weathers is the son of former MLB reliever David Weathers, and was named the Tennessee State Basketball Tournament MVP after leading the Loretto High School boys basketball team to its first ever state championship. Weathers best pitch is his curveball which has a sharp downward action and is a pitch that Weathers can throw for a strike when he needs to. Even though he doesn’t possess an electric high velocity fastball, the combination of movement and control gives the pitch a plus grading. Weathers also mixes in a plus changeup that gives him a strong three-pitch mix. Next on the list of high school pitchers is Mason Denaburg. Much like Ryan Weathers, Denaburg is a tremendous all-around athlete. He has excelled as both an outfielder and a pitcher up to this point and if he were to choose to go college he would have the opportunity to continue to do both. Pitching for the USA Baseball U18 National Team last summer, Denaburg’s fastball would touch as high as 97 mph coming out of the pen. As a starter, his fastball will sit more in the 94-96 range with tremendous late life that makes it a swing and miss pitch. Denaburg also pairs that with a plus curveball that has impressed scouts throughout the spring. As with any of these guys taken in the first-round, Denaburg will be given every opportunity to make it as a starter, but if he fails Denaburg could be well set up to make it as a reliever with his strong fastball-curveball combo. Before suffering a shoulder injury earlier this spring, there was almost no question that Ethan Hankins’ fastball was the best pitch in the entire draft class. Its combination of upper-90s velocity with movement that Hankins had a lot of control of gave it a good running at receiving as high of a grade as Hunter Greene’s fastball did before last year’s draft. Unfortunately for Hankins, his fastball hasn’t quite been the same since he returned from his injury. This has caused Hankins to slip in the rankings after originally being thought of as the top high school arm in the draft and as a possibility to go number one overall. Hankins’ secondary offerings show signs of potential, but he still has a lot of work to do to become more consistent with those pitches. One thing that really impresses me with Hankins is the way he works on the mound. He is a pitcher who works very quickly and is constantly changing up his motion. This really messes with the timing of opposing hitters and it makes it difficult for them to get comfortable in the box. Jackson Kowar has been linked to the Minnesota Twins in multiple mock drafts of late. Kowar is yet another pitcher to come out of the University of Florida which has produced pitching talent hand over fist the last few years. Kowar will rely heavily on his fastball and changeup as his curveball can be inconsistent at times. His fastball will sit around 93-95 but he can pump it up to 97 when he needs it. Kowar’s changeup is easily his best pitch. He has the uncanny ability to throw it to both righties and lefties and will produce a lot of swing and miss with the pitch. Even though Kowar is a college pitcher, at 6’5” and 180 Kowar still has some projectability left in his frame. Kowar also has the type of delivery that scouts are looking for as it is very repeatable and doesn’t require a lot of effort. Brice Turang is the top shortstop available in a class that is very thin at the position. With that being the case, I wouldn’t be surprised if he goes a little earlier than some people expect as shortstop is a position that many teams like to stockpile in their farm systems. For a shortstop, Turang is an excellent hitter. He has a pure and quick swing that gives him the ability to pepper the ball to all parts of the field. He will never have much power but could be someone that develops into a 10-15 homer guy as he matures. Defensively, Turang is a safe bet to remain at short as he possesses both the range and arm desired for a guy to make it at the position. Turang is also refined mechanically at short, which is what separates him from some of the other high school shortstops in the class. When it comes to raw stuff, Kumar Rocker is right there near the top of the list in this year’s draft. Rocker has a fastball that will sit in the 94-96 mph range and can pump up even higher when he needs it. Rocker also features a sharp breaking ball and an upper 80’s changeup. Rocker generates his power from his big lower frame. Rocker also comes from good athletic bloodlines as his father Tracy Rocker was a defensive lineman in the NFL and won the prestigious Lombardi award during his college career at Auburn. With Rocker’s combination of size and athleticism, it doesn’t take much in the way of effort for him when he pitches. However, the knock on Rocker is the question on his ability to develop into a pitcher as he begins facing more talent closer to his level. It is also hard to see continued development on his stuff as he has already filled out his body pretty well. Compared to some of the other pitchers in the draft class, Ryan Rolison isn’t a guy who will exactly jump out at you. His will typically throw his fastball between 90-92 mph, though he still gets some swing and miss with it. Rolison’s best pitch is probably his curveball, which has potential to be a plus pitch for him. Rolison also has an average changeup, which gives him a complete three pitch mix. 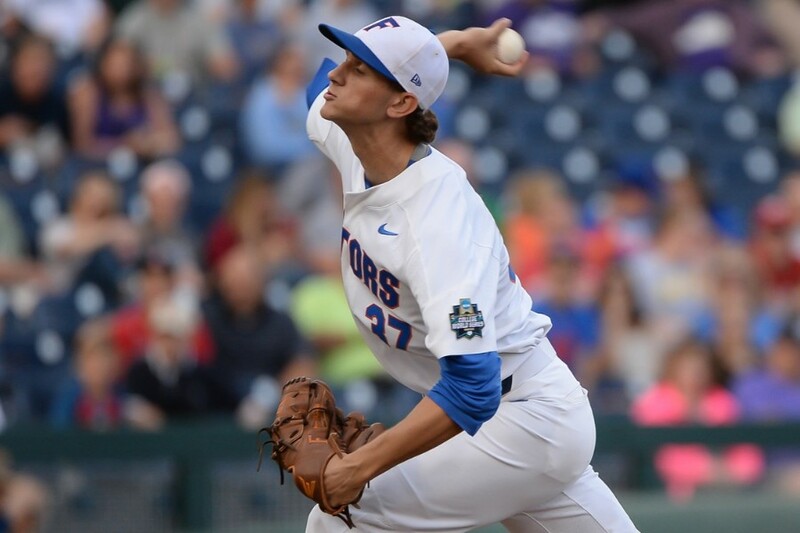 Rolison has had some success pitching against some of the best competition that college baseball has to offer in both the SEC and Cape Cod League. Despite being not being known as much of a stuff guy, Rolison has still had success striking out opposing hitters to the tune of 10.6 K/9 this spring. Rolison benefits from creating some deception on his pitches. As a lefty, Rolison will stand on the first base side of the rubber and has a cross-stepping delivery that allows him to release the ball from an angle that hitters aren’t used to. Jarred Kelenic has grabbed some headlines for having the potential for being the first ever high school player drafted in the Top 10 out of the state of Wisconsin. There have been some varying opinions about Kelenic’s ability to stick as a top prospect as the track record for Wisconsin born players is bleak. Despite this, Kelenic has done an excellent job proving himself on the national level playing well for the USA Baseball 18U National Team. Kelenic has built himself a bit of a reputation for his incredible work ethic and raw passion for the game. It is foreseeable that Kelenic could add more power to his game and if he does he could be a true five-tool player. There is some debate over whether Kelenic has the range to stick in center or if he will need to move to a corner outfield position. Kelenic does have good speed but not quite the burning speed you see out of most MLB centerfielders. However, Kelenic does have great instincts in the outfield, so that could help make up for what he lacks in speed. Travis Swaggerty burst onto the scene last year after having a big sophomore campaign at South Alabama. He then followed it up during the summer as the center fielder on the Team USA Collegiate National Team where he had a slash line of .328/.449/.406 with six stolen bases over 19 games. There isn’t a lot of doubt about Swaggerty’s ability to stay at center field at the next level. He is a plus runner and an excellent defender, with an above-average arm for a center fielder. At the plate, Swaggerty brings a patient approach, walking more than 17 percent of the time in his college career. That along with his speed and ability to hit for average could make him an ideal leadoff hitter at the next level. Swaggerty also has a little bit of pop in his bat, hitting double-digit home runs in each of his last two seasons at South Alabama. Above all sports, in the baseball draft, you never draft for need. You draft the best player available, develop them, cross your fingers, hope for the best, and know depth also allows for future trades, whether it be at the ML or milb level. But despite a few interesting options at the milb level, if the Twins cant find a couple catchers they really like, they should pounce! I won't hold my breath on catchers dropping to them at 20... I do hope one of those HS arms does though. From there I hope they take the best college C at 2 or 3 and draft a couple more in the top 10. HS catching is harder to find, but if they can get one of those in this draft, I'll be pretty happy.. I'd also note that by our pick, there won't likely be a clear BPA. Expect that at least half of these players from this group of 10 will be available when the Twins draft at #20.Wouldn't be surprised if it is one of those five high school pitchers between #14 and #20. Really the only catcher I see going before the Twins pick at 20 is Georgia Tech catcher Joey Bart. After that there are three pretty good high school catchers that I have ranked between 32 and 39. The Twins should have their pick of the three if that's the way they want to go. Agreed. Really hoping Rocker or Kowar drop to us. Sounds like the big high school RHP out of Massachusetts, Mike Vasil, is opting out of the draft and honoring his commitment to U of Virginia.Think Andrew had him ranked at #27. Sounds like the big high school RHP out of Massachusetts, Mike Vasil, is opting out of the draft and honoring his commitment to U of Virginia. Think Andrew had him ranked at #27. While this is true recently of Vandy, and Rocker would be well-served to head there (better such than Ethan Hankins, for instance), don't sleep on the Orioles. They made some personnel changes in their minor league system on the pitching side, and the results this year have been incredible at every level. Their Delmarva pitching staff at times has featured five starters with sub-2 ERAs and better than a 9 K/9 (promotions and such has changed who has been in the rotation at times, but still...). Now, if the Orioles would ever, EVER sign an international talent....but I digress. Not all will go there, but it says a lot. So here's another question, which schools consistently graduate major league ball players? I'm curious what the correlation is there. I'd pay, assuming I could use the Pohlads money. Of all the prep arms, I think he's the one that's gonna end up being the best one. Gonna be hard to over pay, now that they've sold the 74th pick. Rocker absorbs quite a bit of risk here. He has to pitch for Vandy for 3 years. And yes, is they develop him right, he's going to be in line for a top 5 selection in that point. The question really is whether that extra signing bonus is worth the risk of never getting drafted. Considering that no matter where he's drafted in the 1st round, he's set for life if he's smart, I'd argue smart money would be on going pro. He's also likely to spend less total time in the minors going pro straight out of HS than the time post college + his 3 years of college. I agree with most of that but I'd point out that most players of his ability get some kind of insurance before they go to college to offset some of that risk. But our #20 pick is worth 3.1m and I'm sure the Twins could probably get that up toward 4m if they really had to. My guess is that they don't overpay since they lost two picks already but they could.